Today, using a VPN to hide your identity and location makes more sense than ever before. As netizens of the Internet, we face cybercrime, data mining, targeted marketing, and the threat of ISPs and other agencies snooping on our activity. VPN-enabled routers add an extra layer of security to guard against these dangers. Not only can you protect single devices with a VPN, but your entire home network (and subsequently, all devices connected to the network) can benefit from the protection. By using a router that supports VPN software, you can protect an entire family of devices without worrying about maxing out your simultaneous connections—very few VPN services offer more than 5 at any given time. Because your router installation only counts as one device, anything connected to your router will not count towards this limit. We carried out extensive research into the current offerings (100+ reviews!) on the market heading into the new year. Looking at metrics such as speed, security, compatibility with different VPN services, and, of course, price points, we have curated a small list of the best VPN routers on offer right now. Although speed, VPN compatibility, and security are all important, there are other factors that need to be taken into consideration. Specifically, usability and hardware. Most routers you come across will not come with suitable firmware installed that supports VPN services. 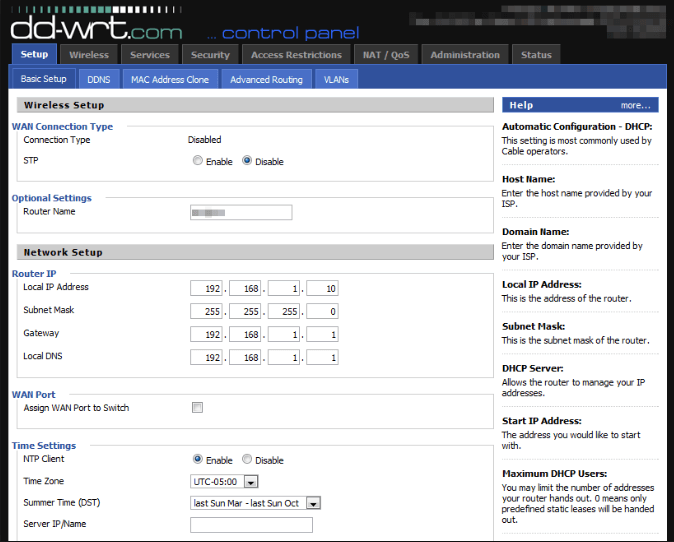 DD-WRT and Tomato can both be configured through an intuitive web interface. While some VPN providers do have apps that support specific routers and models, people that don’t own one of these have to install the firmware themselves. That is, assuming they own a router that allows firmware installation. Not all routers do, especially those provided by ISPs. This firmware is generally either DD-WRT or Tomato, two open source pieces of firmware that are free to use. They are purpose-built for VPN usage and provide you with the scope to make tweaks and changes, for example to allocated bandwidth and range. If you plan on buying a VPN router, especially any featured in our list, you don’t need to worry about this, but it’s worth knowing about regardless. 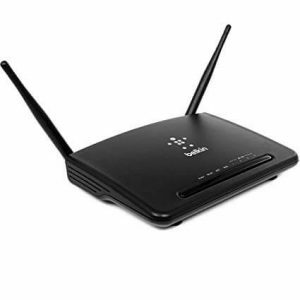 Most routers have two antennas (or one!). This is known as single-input, single-output (SISO). One antenna sends data and the other receives. 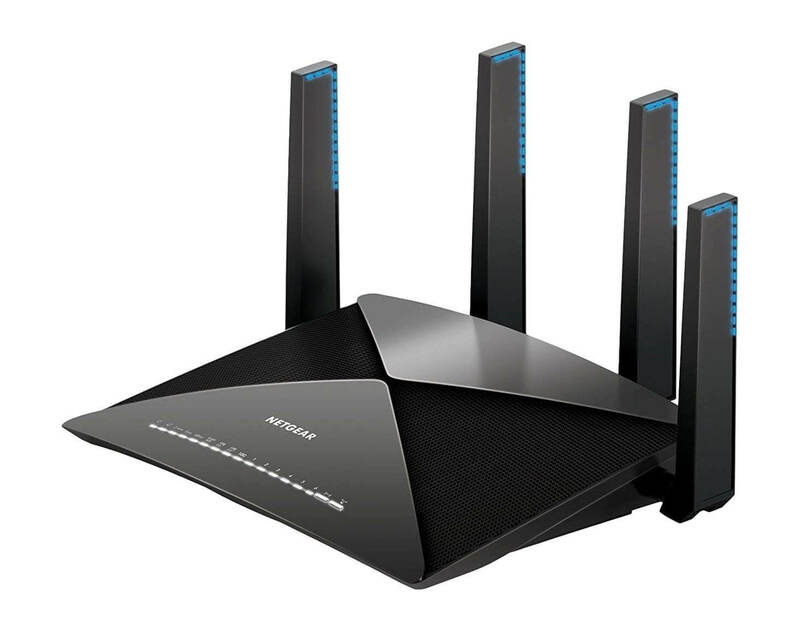 If you’re using a router provided by your ISP, chances are you’ll have one of these. For casual use, this is just is just fine. However, a SISO router is never going to be the fastest available. MIMO routers (multiple-input, multiple-output) have–you guessed it–more than one antenna for input and output. Two or sometimes three of each antenna means two or three times faster data transfer and a more reliable connection. To make things a bit more complex, it is multiple-user MIMOs that make the very best VPN routers—these can communicate with multiple devices at the same time. Dual-band routers can transmit data across both the 2.4GHz and 5GHz bands. When the 5GHz band gets too crowded, it will switch your data to the 2.4GHz band meaning that performance won’t be hampered during peak times. Although routers tend to use the 2.4GHz band by default, we recommend configuring yours so it uses the 5GHz band instead. This delivers higher levels of performance and the difference is definitely noticeable. You can do one better with a tri-band router, though. 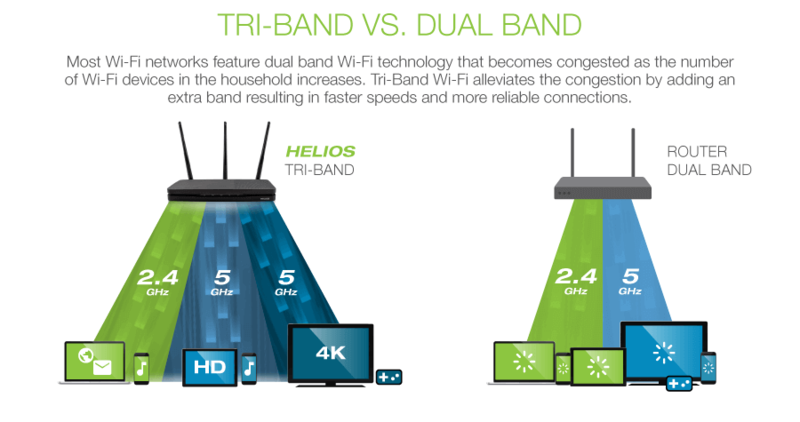 A tri-band router will transmit three different signals that are divvied up between all your devices. With a tri-band router, there are three frequencies—one at 2.4GHz and two at 5GHz. Most of our readers will not have such a demanding network but it doesn’t hurt to future-proof your hardware! VPN routers that have a better CPU–the processor–will work a lot faster. Think of your router as a miniature computer whose job is to figure out the best way for your data packets to be forwarded to their final destination. To do its job correctly, it needs a CPU and, as with your computer, the better and faster the CPU, the faster it does this job. A lot of router manufacturers these days advertise the number of cores their products have and what their processor speeds are. This is important information if you are a ‘power user’ who wants to carry out advanced tasks such as VPN configuration because firmware such as DD-WRT and Tomato have certain CPU requirements. All the VPNs in our list below feature powerful CPUs that are perfect for running VPN firmware. Without further ado, here are our picks. Remember how we mentioned that some routers can have two or even three of each antenna (three input, three output)? Well, how about four of each antenna? That’s exactly what you get with the Asus RT-AC5300 tri-band router. We’ll be the first to admit that this is going to be a bit overkill for most people. But, if you want high performance then that’s exactly what you’ll get with this router, and then some. Designed to cover larger homes, the eight antennas can cover a massive 5,000 square feet and it is MU-MISO, meaning it can communicate with several devices at the same time. As with most Asus routers, it is optimized for VPN usage meaning installation is a breeze and you won’t notice any drops in performance. Another fully-loaded VPN router is the D-Link AC5300. 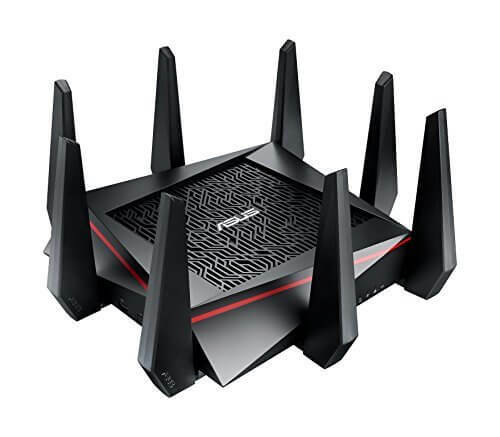 Offering comparable wireless performance to the Asus AC5300 router, it is another firm choice for somebody who wants unrivaled performance when using a VPN service through their router. It comes with 8 antennas with further upgrades available, but we really can’t see the average user needing to take advantage of this. 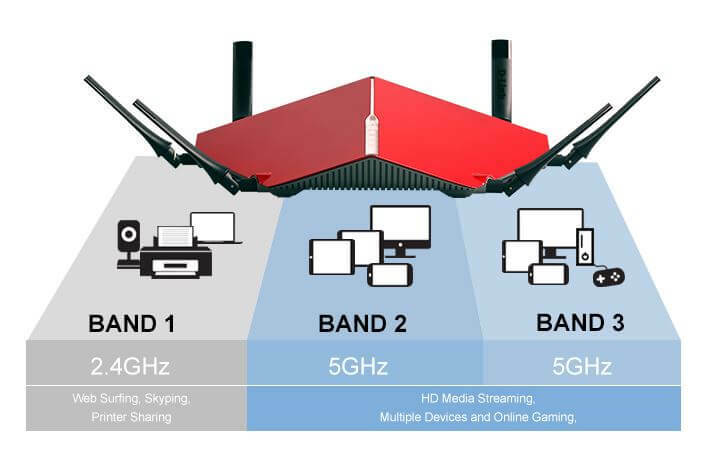 Also, just like the Asus router, it is tri-band and can support simultaneous connections from multiple devices at one time. Its QoS (Quality of Service) engine prioritizes traffic and ensures the best performance for activities and programs that are data-intensive such as streaming video or playing games. Finally, it automatically adjusts transfer rates to prevent network latency when a slower device connects. What the NETGEAR Nighthawk X10 loses in terms of antennas—as you can see, it has four instead of eight—it makes up for in being a wireless AD router instead of a dual or tri-band router. Alongside a 1.7GHz quad-core processor, this provides serious speed for devices that support 60GHz connections. While 60GHz connections are nowhere near being common yet, they will be in the future and the X10 is a great router to buy in preparation. Like the D-Link router above, it has QoS software that prioritizes traffic and ensures peak performance for data-intensive tasks. While the X10 is pricey, it is a router that is future-proof and will last for a number of years… not something that can be said for even pricier dual and tri-band alternatives. 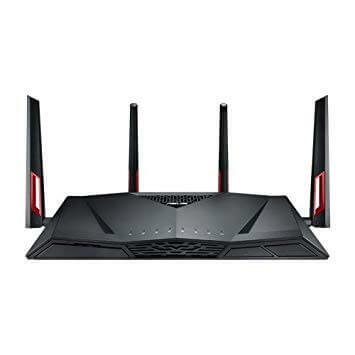 The Asus RT-AC88U is a dual-band router featuring two pairs of antennas that were designed specifically with video games in mind. Naturally, this makes it a good VPN router as it can stand up to high-performance tasks that are data-intensive such as streaming and torrenting, two things VPNs are regularly used for. VPN setup itself is relatively painless and the router supports DD-WRT. Most VPN providers have guides available on their websites to walk you through the process. 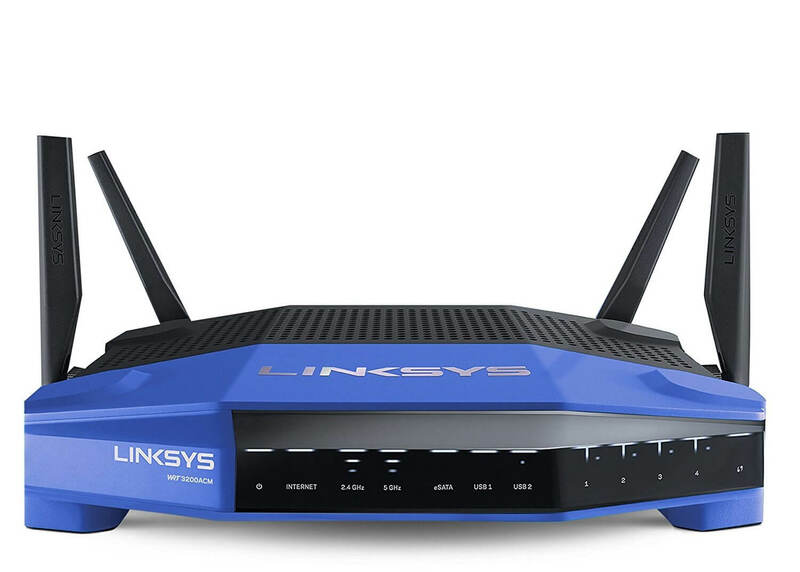 Finally, we have the Linksys WRT 3200. While it is by no means going to blow you away in terms of its performance, it is still good enough for most VPN users and is by no means a weak device. If you simply need a router, any old router, that supports a VPN, go with this Linksys model that won’t break the bank and includes all the features and support you need. It is a tri-band router with two pairs of antennas. It supports DD-WRT for seamless VPN compatibility and there are USB 3.0 and 4Gbps Ethernet ports, too. 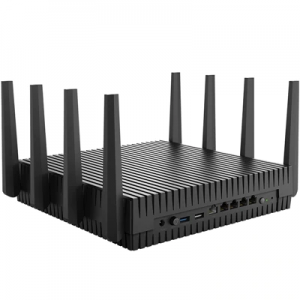 These features alone make the AC3200 a brilliant router in itself without even considering the support for VPN services. Thanks to DD-WRT, VPN installation is a breeze and all VPN providers that support routers have their own guides and documentation to help you out if you need it. Is all this too much for you? Do you just want to buy a router and get going without all the hassle of configuring it yourself? If you want the easy way out and are only interested in having a VPN router that works easily and with minimal fuss, you can always opt to purchase a pre-configured VPN router. Essentially, a standard router (e.g. one made by Linksys) comes pre-loaded with a certain VPN service and is ready to use out of the box, all you need to do is authenticate. Of course, the major pro is that you get all the benefits associated with a VPN router without having to choose and configure one yourself. The downsides, however, include the fact that your choice of a router is limited and that you pay the price of convenience—VPN-specific FlashRouters are often quite expensive. Whichever option you choose, we hope you’re now armed with sufficient knowledge to find the best method that works for you!